Feeling lonely can be fleeting, felt for just a day, or for it can be a longer term emotion. It is useful to think positively about doing something to help yourself out of loneliness, while remembering not to blame yourself for feeling this way. Feeling lonely is a normal human emotion and is simply a sign of wanting contact with people. It can often happen because of external circumstances, such as loss of a loved one. If you have been feeling lonely for a while, a first step is to notice and identify this, even if just to yourself. This can help you can think about what you could do to help yourself, or how to ask for help from others. Think about yourself – think about what you would like more of – maybe time with friends or family, if so invite them to visit. Often if you are lonely you think people do not want to visit. This is understandable but often people will respond to an invitation and will come and spend quality time with you. Look after yourself – if you can do something to improve your health, take small steps to eat well, take gentle exercise and keep active, all of these things can help you to relax more fully in your own company. Share your skills and time with others – you can offer time or specific skills by helping out in your street, neighbourhood or with local organisations. You could volunteer with the Royal Voluntary Service, Sense or Independent Age who support older people. Your community and neighbourhood – find out what local activities are being planned and book them up: walks, singing groups, book clubs and bridge. For example, Contact the Elderly and the University of the Third Age have a wide range of local social groups and activities across the UK. You can also call The Silver Line helpline on (freephone) 0800 4 70 80 90 for information, advice or just for a chat, 24 hours a day and 7 days a week. Speak to a health worker if you feel very lonely – long term loneliness could contribute to later depression and other health problems. Your GP should be able to direct you to local services. Order a free guide: Independent Age have produced a Wise Guide called Healthy, happy, connected – support and advice for older people living alone. This will help you to find free groups and classes in your local area, discover volunteering opportunities and suggest ways of getting the most out of life. Order your free copy by calling 020 7605 4225 or email comms@independentage.org. 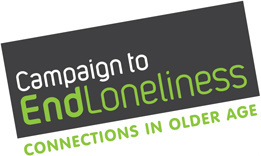 For general queries email us at info@campaigntoendloneliness.org.uk or call us on 020 7012 1409. In August 2011, Dame Esther Rantzen DBE (who founded the children’s helpline ChildLine in 1986), wrote an article about the loneliness she has experienced since being bereaved, and living alone. She was overwhelmed by the huge response from older people who shared her experience. In November 2011 she was invited to make a key-note speech at a conference at which she came up with the idea of creating a helpline in order to support vulnerable older people, sign-post them to projects and services, break through the stigma of loneliness and isolation, and tackle the problems of abuse and neglect. As a result, Paul Burstow, (then Minister of State for Care Services), hosted a round-table seminar on 1st February 2012, chaired by Esther Rantzen, at which many of the major voluntary organisations working with older people were represented, together with members of the statutory sector. The enthusiasm and support of all the attendees lead to an initial grant of £50,000 pledge as “seed money” by the Department of Health. A pilot was launched in November 2012, funded by Comic Relief covering the North East, North West, Isle of Man and Jersey. Following a successful pilot The Silver Line was awarded a £5 million grant from the Big Lottery Fund in September 2013 to support part of the first two years operation. This grant allowed the Silver Line to launch in time for Christmas – often the loneliest time of year for older people. Advice and information for older people. Support and information for people suffering from anxiety disorders. Details of practitioners in your area. Social activities for people over 75 with little or no social support. Advice and practical support for single parents. Support and advice for adults suffering from past childhood abuse. Counselling for adults with relationship difficulties. 24-hour support for anyone in distress or despair. Imagine being an elderly or disabled housebound person and not seeing anyone for four, five or even six days in a row. Our volunteers befriend housebound people in the London Borough of Ealing….and last year they made over 2,550 visits to isolated and vulnerable housebound people.